Being a fast growing plant, supply usually far exceeds demand and we were able to sell our abundant leaves to a vegetable seller who frequented our backyard garden every other third month to harvest them! This lasted about 15 years when our plant was on ground where it grew so profusely before we cemented the whole backyard in year 2002. Since then, we’ve planted in a container and comparatively it grows slower, though provides more than sufficient curry leaves for our own use, but not enough to reap $$$…anymore!! 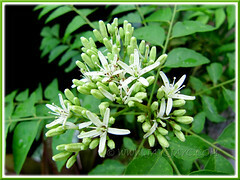 Plant type: An aromatic shrub or small tree, natvie to India, Sri Lanka, Bangladesh and the Andaman Islands. However, it is now widely cultivated in other tropical to subtropical regions worldwide, including South East Asia, Australia, Pacific Islands, California, etc. Moisture: Requires medium water regularly. Soil: Well-drained and fairly fertile soil. Propagation: Easily propagated from seeds, stem cuttings or rooted suckers from the mother plant. Features: Murraya koenigii is a relatively small or medium-sized semi-deciduous tree ranging from 2.5 – 6 m in height. It has luxuriant rich green foliage with bipinnately compound leaves, each bearing 11-21 lanceolate leaflets (2-4cm long and 1-2cm broad). Funnel-shaped flowers are small, white and fragrant, clustered in a terminal cyme. It also produces clusters of shiny berry-like edible fruits that ripen to purplish black in color. Usage: Murraya koenigii’s aromatic leaves are used as an important and essential ingredient for food flavouring in Indian and Asian cuisine – mainly in curries, vegetarian dishes, fish, prawn and meat dishes, curry powder blends, etc. 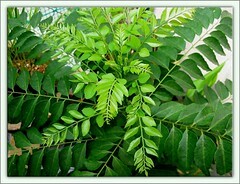 Best to use the curry leaves fresh, though can be used dried or powdered. 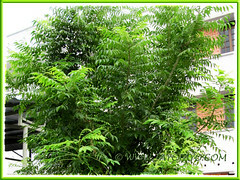 In India, Curry Leaf Tree are grown commercially for export of their curry leaves. This plant can also be grown as an ornamental shrub, attracting birds seeking its ripened fruits, and butterflies such as the Lime Butterfly and Common Mormon, since Murraya koenigii is also a larval host plant for several kinds of butterflies. 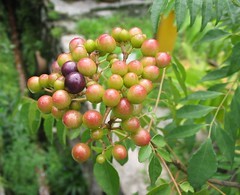 Its fruits are edible and liked for its sweet and nutritional value. 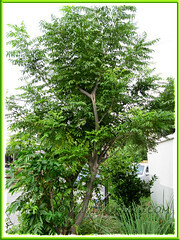 Besides, the leaves, bark and roots of the Curry Leaf Plant/Tree contain many medicinal properties. It has anti-diabetic and antioxidant effects. Read more of its medicinal uses at the external links provided below. Care: Preferably, grow Curry Leaf Plant where there’s ample sunlight. Fertilize every 2-3 weeks during the growing season and trim regularly to maintain a bushy plant/tree for steady supply of young curry leaves for cooking. Least bothered by serious pest and diseases, though do look out for caterpillars that feed on its leaves. For temperate zones: Hardiness – USDA Zone 9a to 11. More information at Dave’s Garden. More external links: Explore Plant Cultures and Horticulture at Purdue University. Could you please tell me how to care the plants if kept indoors. Hi Sreelatha! Sorry, we’re unable to advise as we’ve never grown our Curry Leaf plant indoors. Jacque, please check it out at Plant Cultures on how to propagate Curry Leaf from stem cuttings. My pleasure, Jacque, and all the best to you!